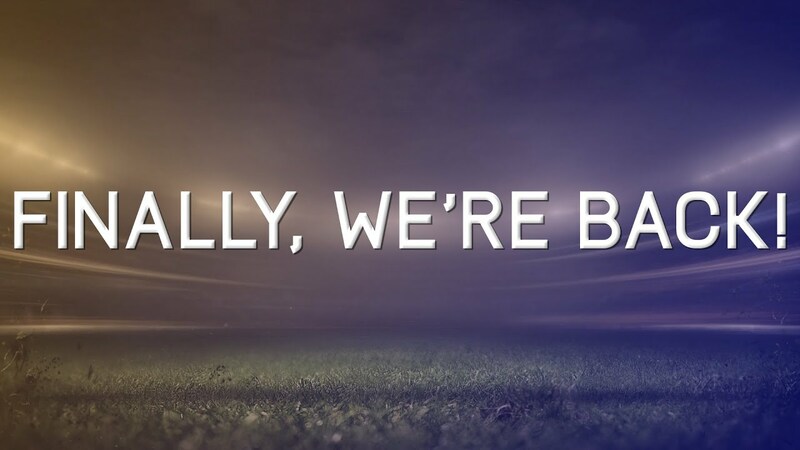 We're Back! 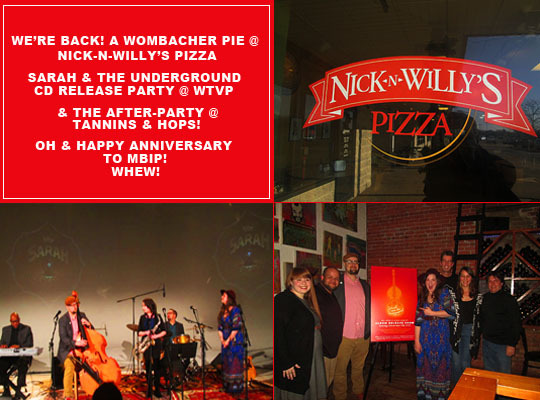 A Wombacher Pie @ Nick-N-Willy's Pizza, The Sarah & The Underground CD Release Party @ WTVP & The After-Party @ Tannins & Hops. Oh & Happy Anniversary To MBIP! Whew! Okay, we’re back and this post is a trifecta of happenings! Right before I found out I had to have heart surgery, De Ingles from Smiley Graphix contacted me to let me know that Nick-N-Willie’s Pizza were naming a pizza pie after me! This was exciting news, but I had to go and get cut open first so checking out this pizza pie got put on hold for a few weeks. In that time I also found out that Sarah & The Underground was not only releasing their first CD, they were having a party at WTVP and then there was going to be an after-party at Tannins & Hops. And to add to all of this, today is the sixth anniversary of the very first posting here on MBIP! So we’re going to jumble up all of this information into one rambling and shambling post and here we go! Here We Go: First Stop @ Nick-N-Willy's Pizza! Nick-N-Willy’s is a hidden gem located in the Metro Centre. You have to drive all the way to the back to discover it and that’s what I’ve just done! 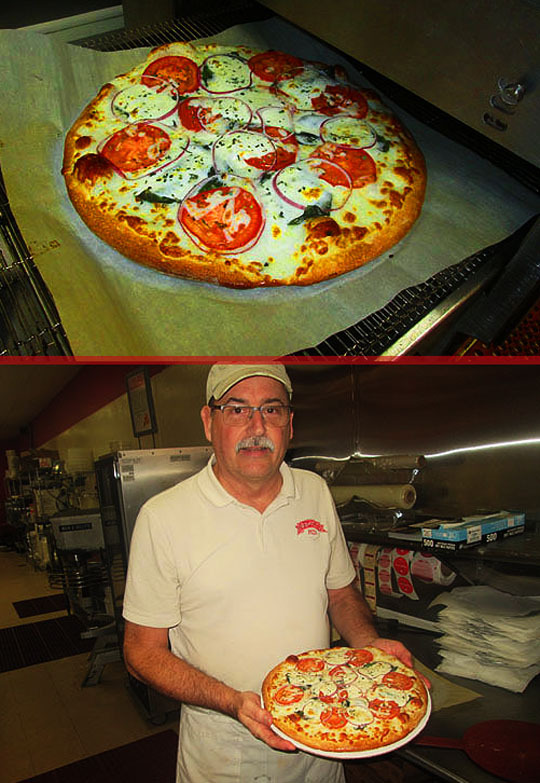 It’s been in business for over 24 years, making it one of Peoria’s oldest Pizza parlors. Let’s walk in the door and take a look at the menu. There it is, The Wombacher pie that you can only get at Nick-N-Willy’s! This is quite an honor and I’m dying to take a taste of this personalized pie! 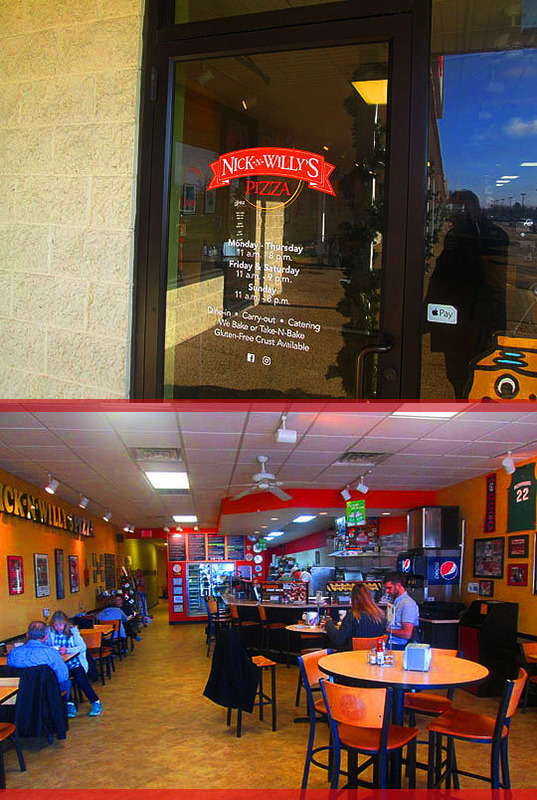 Let’s go back where the pizza construction happens and meet the two gentlemen behind the counter. On the left is Steve Carter who’s owned Nick-N-Willy’s since they opened the doors here. On the right is his trusty sidekick, Brennan Ingles! 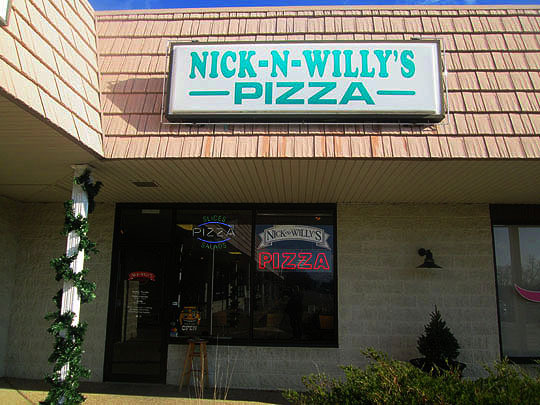 Brennan has worked here for over two years and in the two decades that Nick-N-Williy’s has been open, Steve has hired a lot of local talent to make the pizza creations here through the years. Now let’s see how they construct the Wombacher Pizza Pie! There’s Steve putting it all together. The Wombacher Pie is made with their homemade crust, medallions of white mozzarella cheese, garlic, Roma tomatoes, red onions and fresh basil. This is a true Northern Italian Pizza Pie! And the only place in Peoria serving this is Nick-N-Willy’s in the Metro Centre here in Peoria, Illinois! Steve slides the Wombacher Pie in the oven and as it cooks, we’ll take a little look around in here. One cool thing Steve does is feature local artists on his walls. One of the featured artists this month is Kelly Kimball,founder and artist at Inknoor. You can see more of his work by clicking here: Inknoor. The pizza is out of the oven and there’s Steve holding up The Wombacher Pie! 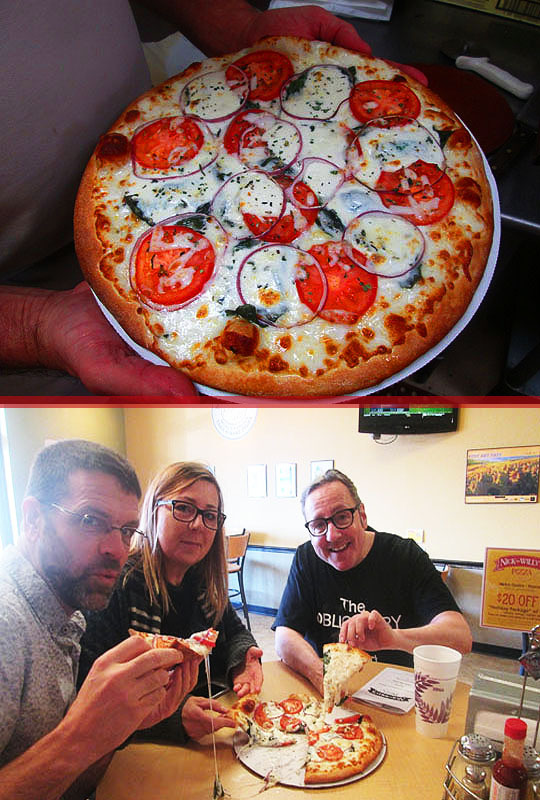 It looks fabulous and there’s John and De Ingles joining me to try a slice of this delicious pizza pie! If you want to sample The Wombacher Pie. If you’d like to try The Wombacher Pie at Nick-N-Willy’s, there’s a special offer starting today and ending on December 16th. If you mention MBIP you can get a Family Size Wombacher pie for 50% off! Stop in try it this week! Okay, now it’s time to head off to part two of this blog! Part Two: Sarah & The Underground CD Release Party @ WTVP Studios! Here’s the reason for this celebration, the debut CD from Sarah & The Underground. If you’d like your own copy you can purchase the online by clicking here and here. And check out their website and facecrack page too! And now, please welcome…Sarah & The Underground! Courtez Banks on keyboards and Chrys and Jessica Wilson on vocals. This was a fabulous show and photos alone don’t do it justice, so you need to go and buy the CD to hear the soundtrack. Once again, click here and here to purchase this fabulous sound of Sarah & The Underground! After-Party @ Tannins & Hops! There was an after-party across the street at Peoria’s original Speakeasy, Tannins & Hops. Usually the secret password is, “I hear this plays in Peoria,” but they adjusted it last night to, “I just heard Sarah & The Underground play in Peoria.” Luckily I knew this and got waved inside! Once inside I saw Nick behind the bar and a tableful of people ready to have some fine food and drinks! The Projekts, who added guest vocals to the show were the musical entertainment and I settled into a table with Chelsie, Daniel and Peter Kobak, who is running for City Council. Check out Peter’s vision for Peoria Progress right here. I showed Peter some photos of my leg that got chewed up in Mexico and Chelsie captured that moment in these two photos! Thanks again to Sarah and Brandon for a wonderful show and a delightful evening in downtown Peoria! Today is the sixth anniversary of MBIP! So I ended the night with a Wombacher Sour made by Sallie! I’m honored that they named this cocktail after me and now you can pick up a Wombacher Pie at Nick-N-Willy’s and wash it down with a Wombacher Sour! It’s hard to believe that it’s been six years of doing this blog! Thanks to each and every one of you who read it and we’ll see you all tomorrow!